CRAPTASTIC: Halloween Swap With Pink Stitches! I think by now the words Pink Stitches are a regular part of my vocabulary! Bonnie and I have done so many swaps, and she never fails to amaze me with her awesome skills! 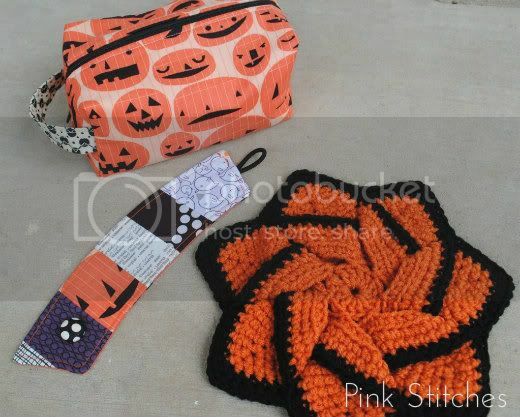 A few weeks ago she set up a Halloween/Fall themed swap and she and I paired up! She is the most generous swap partner ever! She always spoils me rotten,so I tried to do the same for her this time! I hope you're ready for a picture heavy post - there are going to be a ton!! I tied in the Halloween theme by making Bonnie a little "BOO" banner! The pennant blocks are cut from black burlap (found at Hobby Lobby) and the ties are sewn from orange gingham. I used freezer paper as a stencil and painted on the burlap with orange acrylic paint. I made the polka dots by dipping a bottle cap in a thin amount of paint! Next, for the fall portion of the theme, I made a modern mug rug with leaves on it. I love how you can see the stitched imprint of the leaves on the back of the mug rug! Everything else I made didn't really tie into the fall/Halloween theme, but were things I thought Bonnie would enjoy. She had mentioned she wanted a pincushion, and she likes log cabin style quilting, so I made her a quilted pincushion with an appliqued elephant in the center. I also had my first attempt at a sharpie mug. 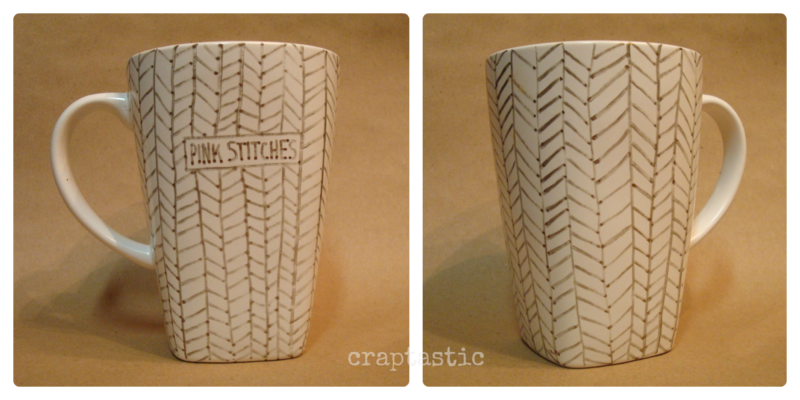 I bought the porcelin mug from Target and used a gold metallic sharpie to draw on Bonnie's blog name, Pink Stitches, then draw a herringbone pattern around the rest of the cup! I always include a little something for Bonnie's son, and while I was trying to decide what to get him I saw this link on Bonnie's pinterest account for a subtle superhero shirt. The design was from I Am Momma Hear Me Roar. 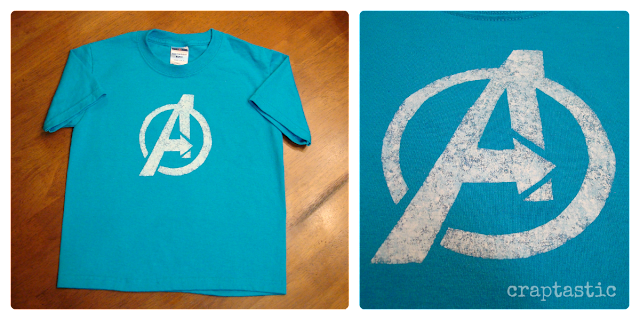 I loved the original design, but didn't have the capability to cut out all the cute details on a stencil, so I decided to make him a more simple Avengers shirt. I achieved the vintage look of the "A" by using a crumpled wad of tissue wrapping paper to apply fabric paint. I love the textured look! I also threw in some Avengers goodies to go with his shirt. 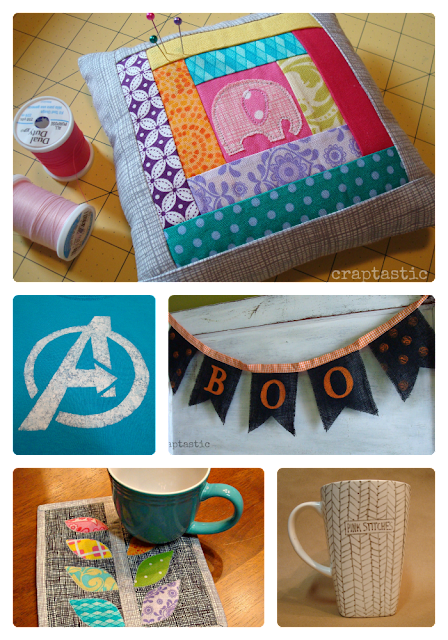 I sent Bonnie some other goodies to go with all her homemade stuff, I just didn't take pictures of it! Now for all the goodies I received! Again, Bonnie is so generous (and super talented). I took the box pouch that Bonnie made to work today and received so many compliments on it! 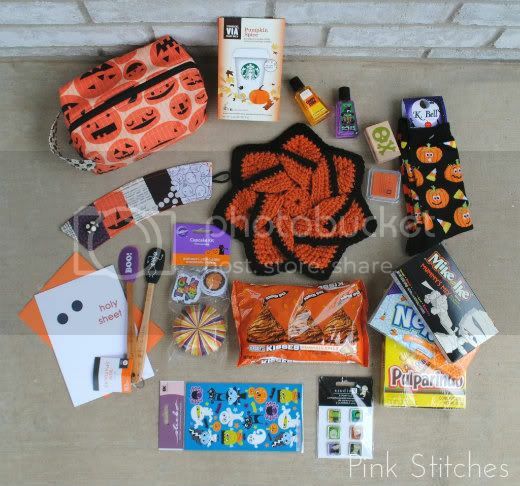 She had it filled to the brim with yummy treats and cute Halloween stamps - she even sent me some ink! I can't wait to take my coffe hugger to Starbucks - and I'll definitely be using my pot holder soon! Isn't Bonnie just amazing! Here is a photo of ALL the goodies she sent me! I'm so spoiled! I hope she enjoys them all! I sure will enjoy everything she sent me! I'm so lucky to have met Bonnie! She's become one of my best friends!! You totally spoiled me Katie! I'm in love with everything and AJ loves his goodies! I love the paint technique you used on his shirt, it looks awesome! Thank you so much for everything! Looking forward to our next swap! I need a boo banner - super cute! Love all the goodies you girls created. You are both very talented. And how fun to have a special friend in your life! I came to check you out after you left a sweet comment about my garden and there are so many cute things on here! I love this sweet pin cushion! I saw you are just getting settled in your new house. congratulations, that's very exciting! Thanks Christy! I love the little cushion I made for Bonnie too - I need to make one for myself! :) And thanks, we are loving our new home! So exciting!